I'll post more details later, but I wanted to share a picture and some quick news with y'all. Last night KMM went into upper Kara and took out Nightbane, Netherspite, and Prince. We one-shot the dragons which was hella-sweet. Prince was a little more...interesting. We got him, though, and he dropped the [Helm of the Fallen Defender] token which I got! I tried to force one of our tanks (who is also the co-GL but was on an alt) to roll for it, but he muttered something about looting rules and alts versus mains and I ended up with it. What a swell guy. Seriously. This whole guild is really awesome and I'm having a really good time playing with them. 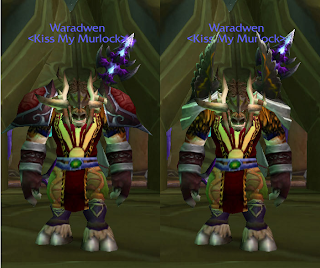 On the left I'm wearing my new regular shoulders (the [Wyrmhide Spaulders]) and on the right I'm wearing my new healing shoulders, the [Ravenwing Pauldrons]. Oh, and before I forget! After the boss kills last night I had enough badges to buy the [Idol of the Unseen Moon]. I probably should have saved up for the trinket but, as I've said before, I'm a serious spendthrift. Only one green remaining!